Create surveys for your clients with a trustworthy, flexible tool that looks like it’s your own. With access to ready-made widgets, templates and the most effective question types. Reflect your brand experience in surveys and quizzes in just a few clicks and make them look custom made. Increase trustworthiness by using your own domain and, as a result, get higher response rates. Give clients (password protected) access to fully branded, custom reports. Manage all your survey users and data in one place. Reach out to sales@surveyanyplace.com for more information on your white label packages. White label surveys let agencies, consultants and others leverage professional surveys without the full expense of creating them from scratch. A great new revenue source for agencies or consultants, and clients get professionally created, well-performing surveys to collect feedback. Survey Anyplace makes customizing point-and-click simple. Why Use Survey Anyplace's White Label Option? Remove all references to Survey Anyplace and have the liberty to take is as far as needed. Just the survey, or everything going from design to results and even the tool itself. Your questionnaire will work on every screen, ranging from the smallest smartphone to the biggest computer screen, your questionnaire will look its best in every situation. We don’t just offer the option to white label your questionnaire, we can also white label your automated follow-up emails as if you had sent them yourself. Don’t plan on using mobile devices, not to worry, we’ve got you covered as well. Easily embed your questionnaire on your site. To use this sample White Label Survey Template, sign up for the trial version of our Professional Plan , and choose ‘White Label Survey’ as template when creating a new survey. 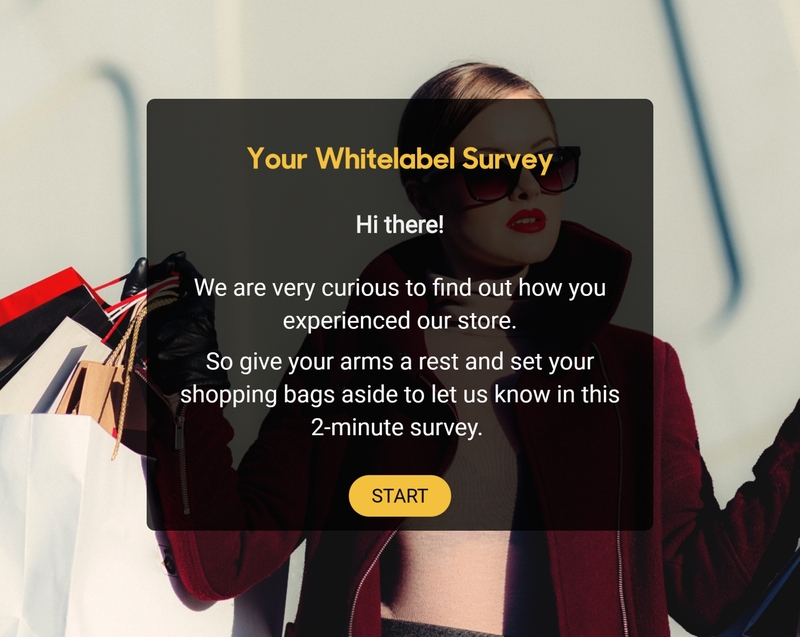 Customize your survey completely with all your brand's logo's, pictures and slogans with our White Label Survey Template!